We can address any issues you have with grey squirrels, the best method of control is to use a body grip trap inside a box which is put up high where possible. These traps are required to be checked at least once per day by law and this can be achieved by working together. Live catch traps can be used in areas where there are red squirrels so any non-target species can be released. Introduced in the 19 century from North America. Can be up to 30 cm in length. They can weigh up to 0.5k. They have a bushy tail. They give birth February/March and June/July. They can have up to 6 infants. They are weaned after 7 weeks. Their build nests in trees and are called dreys. They will nest in rooftops/lofts. They eat nuts, berries and fungi as well as eggs and chicks. They have a very good sense of smell and location to collect food caches. They have displaced the native Red squirrel. They spread the parapoxvirus which is fatal to the Red squirrel. They are classed as a pest because they are not native. 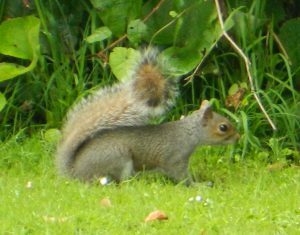 Areas of Scotland and northern England still have Red squirrels. Red Squirrels are becoming immune to parapoxvirus.